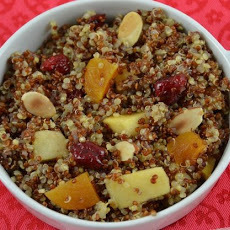 A good source of protein, as well as a host of other energy-generating nutrients, quinoa with fruit and nuts becomes a breakfast for champions with this recipe. It also makes a nice pick-me-up in mid-afternoon. This recipe was a big hit at US Botanic Garden in Washington DC on January16, 2014, and at Brookside Gardens in Wheaton on January 22 2014. Danielle demoed it. Preheat oven to 350. Put the apple chunks on a cookie sheet and drizzle with olive oil. Toss to coat well. Roast them in the oven for 20-25 minutes until tender and edges are browned. Set aside to cool. Toast the almonds in a sauté pan over medium-low heat or in a toaster oven, until fragrant and very light brown. Transfer to a bowl to cool. Make the quinoa: rinse and drain the quinoa, toast in a dry, medium saucepan over medium heat for 3-5 minutes. The quinoa will make a popping sound and begin to smell nutty. Add the almond milk and cinnamon, cover and bring to a low boil, reduce heat. Cook until the almond milk is absorbed and the quinoa appears uncurled, about 15-20 minutes. Add the dried fruit, nuts and roasted apples. Mix well. Adjust for sweetness with maple syrup. Serve with plain yogurt, if desired. Serves 4-5. This entry was posted in Brunch, Recipes from Danielle's pantry, Sides, Vegetarian and tagged almonds, apples, nuts, quinoa. Bookmark the permalink.